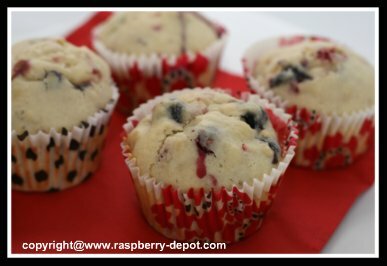 This Mixed Berry Muffins Recipe is very easy to make, and full of delicious natural fruit flavour! I used fresh fruit, however you can use frozen berries instead, but be sure to thaw them first (in a strainer), and discard the excess liquid. Not only do raspberries, blueberries, and strawberries taste so amazing, but they are very good and healthy choices of fruit to include in your diet. These red and blue coloured berries are high in antioxidants. Antioxidants are believed to help prevent and repair oxidative stress, a process that damages body cells and has been linked to the development of diseases such as cancer, heart disease and Alzheimer's disease. 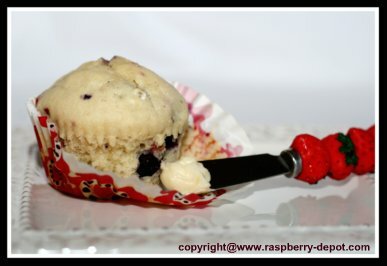 Note - If you are using frozen raspberries for this recipe, thaw frozen berries in a sieve until they are semi-frozen before using, and discard the excess liquid. Cut the strawberries into small pieces, or lightly crush them. Gently stir in all the berries. In another, smaller bowl, beat the eggs, slowly adding the buttermilk, oil and vanilla extract. Make a well in the center of the flour mixture, and pour in the egg mixture, stirring gently, just to combine. Do not over mix. Spoon the batter into greased, or paper lined muffin cups (pan), and bake at 400° F for about 15 - 20 minutes, until well risen, golden brown. Makes 8 - 12 muffins.